Funding has been granted by the Wellington City Council for a further six months for the trial of Urban Dream Brokerage. Working with commercial property partners, Urban Dream Brokerage assists with the revitalisation of Wellington city through brokering the use of vacant shops and commercial spaces by artists for public art and creative businesses. The eighth public art project assisted by Urban Dream Brokerage, a giant illuminated paper iceberg sculpture entitled Cleave, has recently opened in Victoria Street. It is a community art project by artist Gabby O’Connor, placed with the help of Prime Property Group. Two other projects are ongoing in the city nearby in Willis Street’s Grand Arcade (jewellery project Occupation Artists) and Manners Street (The People’s Cinema). The Brokerage is now calling for new public art ideas for vacant spaces by 16 August. "The future vitality of Wellington city depends on harnessing the creative entrepreneurial energy that exists," says Brokerage co-manager Mark Amery. "This energy needs to be matched to the vacant building stock the city has. 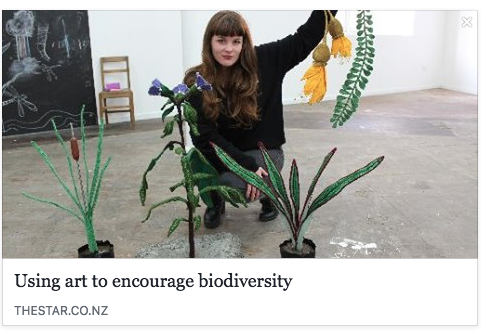 If we want to be innovative we need to grow new enterprise from the ground up and give our creatives the space and, with it ,the responsibility to engage with the city, as befits Wellington’s title as ‘Creative Capital’." Key to the Urban Dream Brokerage’s success is a partnership with Wellington’s property sector, with relationships being built between property owners and managers and creative talent. The People's Cinema in Manners Street provides public space for the people to screen their films and bring community groups together, and Occupation Artists in the Grand Arcade, Willis Street, has seen a group of jewellery artists have an open public workshop and exhibition space, interacting with other small business owners in the arcade. Next door until recently in Grand Arcade Tales of a Dying City sae the city mapped through people sharing their memories and stories of different parts of Wellington with a Wellington theatre company. The Urban Dream Brokerage brokers spaces for innovative public art projects which seek to add new life to the city and suggest creative new ways of using our city. The brokerage arranges insurance for the spaces and ensures licensing and basic conditions are looked after.